The Italian government has demanded that the company in control of the collapsed Genoa bridge rebuild it at the firm's own expense. 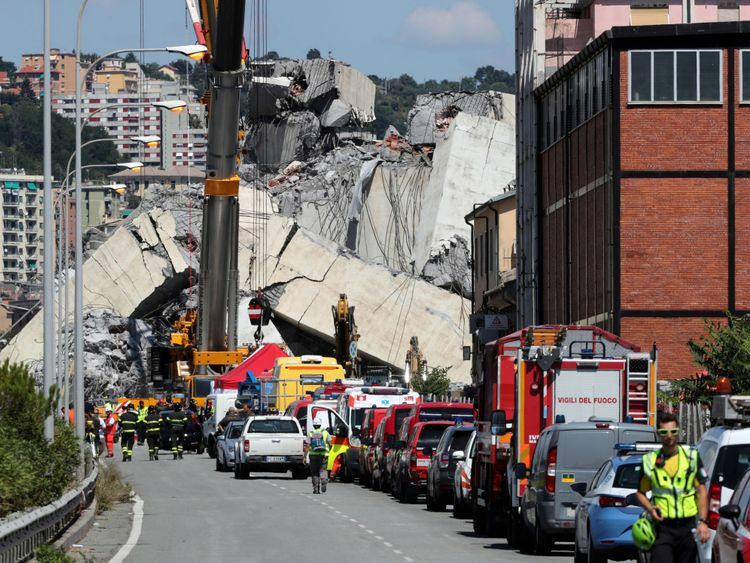 The transport ministry also says it wants Autostrade per l'Italia to complete the rebuild within a limited amount of time and pay to restore buildings and other areas damaged by the collapse. Autostrade - which says it made regular, thorough safety checks - has been given 15 days to show it met its contractual obligations. The government has opened an investigation into the toll-road operator following the collapse, which killed at least 38 people. In a statement, the Italian transport ministry said Autostrade must prove it carried out required work to ensure the proper functioning of the bridge and avoid accidents. If Autostrade is found to have breached its terms it can be fined up to €150m (£134m). Deputy Prime Minister Luigi Di Maio warned the state would have to take over the country's motorways if concession-holders could not do the job properly. As well as claiming at least 38 lives, the Morandi bridge collapse left 15 badly injured, while at least seven have been pulled from the rubble alive.